The Chase SapphireSM Card is offering new cardholders the chance to earn 10,000 Bonus Points after spending $500 in the first 3 months ($100 value). These points can be redeemed towards travel, gift cards, merchandise, or cash back! There is no earning caps, point expiration, or blackout dates. You can also earn 10x points for every dollar spent when shopping at select merchants through Ultimate Rewards Mall and 1 point for every dollar on all other purchases. Chase also provides 24/7 dedicated customer service with premier travel protection benefits to cardholders. Best of all, there is no annual fee with the Chase Sapphire Card. This credit card in particular offers a lot of benefits and that is why people are drawn to it. If the Chase Sapphire Card holder manages to spend $500 within a time period of three months after opening his/her Chase Sapphire account then his/her account would be credited with ten thousand bonus points! When converted into currency, these points are equivalent to $100 worth rewards. If you manage to spend $3000 within the same amount of time, then you’d get forty thousand bonus points or $500 worth rewards. These rewards are very impressive and they can be redeemed through Ultimate Rewards. Limited Time Offer! – Earn 10,000 bonus points after you spend $500 in the first 3 months – that’s $100 toward travel or any other reward! 2 points per dollar spent on dining & 1 point per dollar spent on all other purchases. Most people use their credit cards for footing the bill when they eat out. However, Chase Sapphire Card holders get more advantages when they are using their Sapphire card in order to pay for the food bill. The card holder gets to earn two bonus points for every dollar spent for travel purposes or at restaurants. For other purchases, it is one bonus point per dollar. The reward program offered by Chase, i.e. Ultimate Rewards also offer bonus points when one uses the card for booking hotel accommodations. One can use the bonus points accumulated in one’s account in order to avail discounted air tickets, hotel accommodation, car rentals or even cruises. Thus, one can go on collecting points and even redeem some of it on the way. Generally in case of redemption, the transfer ratio isn’t even but this is not the case with Chase Sapphire Card, as it is a 1:1 point transfer ratio. In other words, a single Ultimate Rewards point is equivalent to one point or one partner mile in case of participating companies. One of the important factors that distinguish an average credit card company from a top notch credit card company is the type of customer service provided. In case of Chase, the customers enjoy great customer service as they don’t have to listen to prompts or prerecorded messages but they have direct access to expert service advisers. This is great because one would be able to get one’s questions answered by real people. 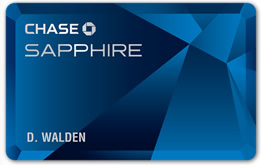 The Chase SapphireSM Card is a great chance for new cardholders to earn an easy 10,000 bonus points ($100 value). It’s great to have a quality card to get returns on all of your purchases, and it’s even better to have a credit card with no annual fee to worry about!